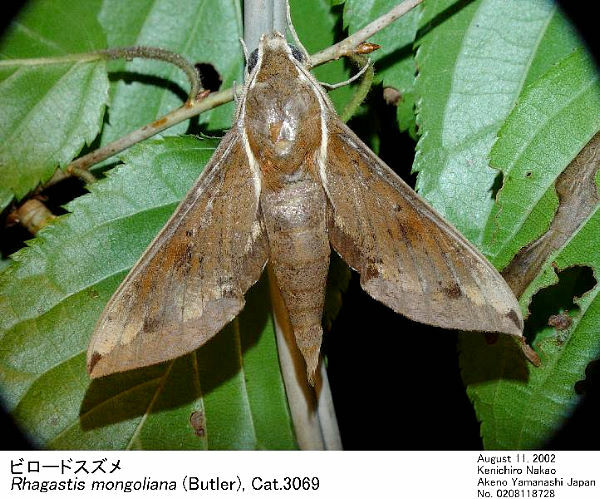 Pergesa mongoliana Butler,  1875, Proc. zool. Soc. Lond. 1875: 622. Type locality: "Nankow Pass between China and Mongolia" [this is the rail pass through the Great Wall, northwest of Beijing; the 'Mongolia' referred to is Inner Mongolia (Nei Mongol)]. Synonyms. Pergesa mongoliana Butler, . Synonyms. 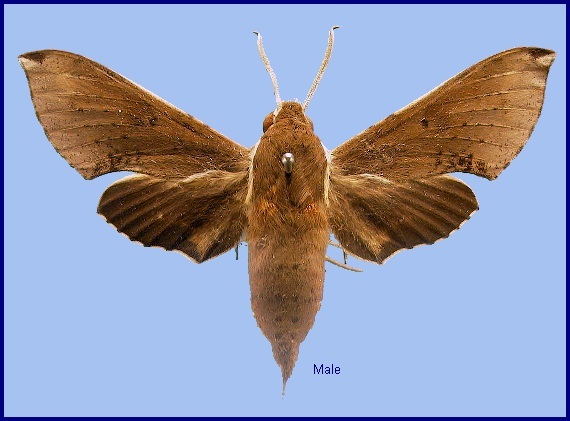 Rhagastis mongoliana pallicosta Mell, 1922. Note. Rhagastis mongoliana centrosinaria Chu & Wang is a synonym of Rhagastis albomarginatus dichroae Mell (Kitching & Cadiou, 2000). Wingspan: 47--63mm. Forewing outer margin more convex than in other species of Rhagastis, except Rhagastis lambertoni, which is easily distinguishable by the strongly falcate forewing apex. Forewing upperside with four postmedian lines (or rows of vein dots) that are more distinct posteriorly, beyond which are two small pale brown patches between Rs4 and M1, and M3 and Cu1, with a similar patch at the wing apex; fringe distinctly black and white spotted. 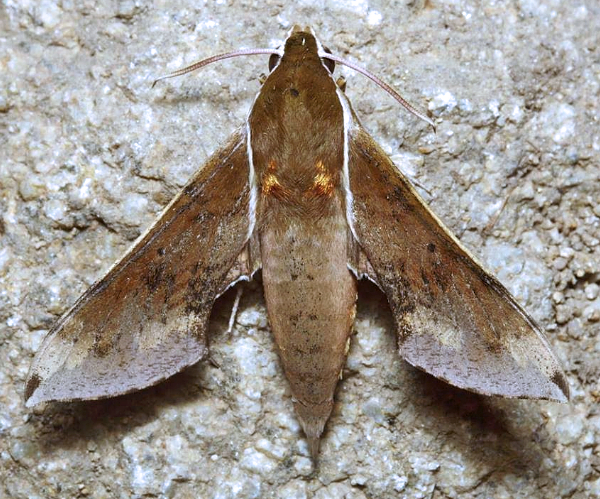 In some specimens, the outer postmedian area is buff-coloured near the costal and inner margins, as in Rhagastis acuta, Rhagastis castor aurifera and Rhagastis velata. Forewing underside with brown submarginal band dilated posterior to vein M2, mostly reaching the basal area. Hindwing underside without a small black discal spot. Labial palp segment 1 apical cavity vestigial; segment 2 about as long as broad, not narrowed to base. Metanotum with a conspicuous tawny patch at each side. 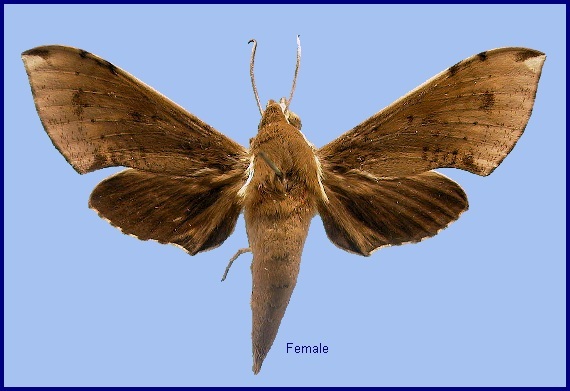 Upperside of abdomen without a pair of lateral golden stripes. Outer row of forebasitarsal spines doubled and trebled. In the male genitalia, harpe slender, somewhat sigmoid. Aedeagus intermediate between Rhagastis velata and Rhagastis castor aurifera; the left process more slender and multidentate near the proximal edge; the right process long, also multidentate at and near the proximal edge, especially near the apex. A woodland species in the Russian Far East, with females active from 23.10h until 01.30h, males from 00.20h until 02.30h (Izerskiy, 1999b). China: v-viii (Jiangxi); 23-24.v (Zhejiang); 25.v (Shanghai); 29.v-2.vi (Hunan); 20.vi (Beijing); 24.vi.-11.vii (Zhejiang); 10.viii (Fengning, north of Beijing); 14.viii (Zhejiang). South Korea: 12.vii. Japan: 1.v-10.vii (Yakushima); 15.v-27.vi (Honshu; Kyushu; Shikoku); 15.vii-31.viii (Takushima; Honshu). Russia: 22.vi-20.vii (Khabarovskiy Kray); 22.vi-1.viii (Primorskiy Kray). In northeastern China, there are two generations a year, with adults flying between late April and August (Yang, 1978). 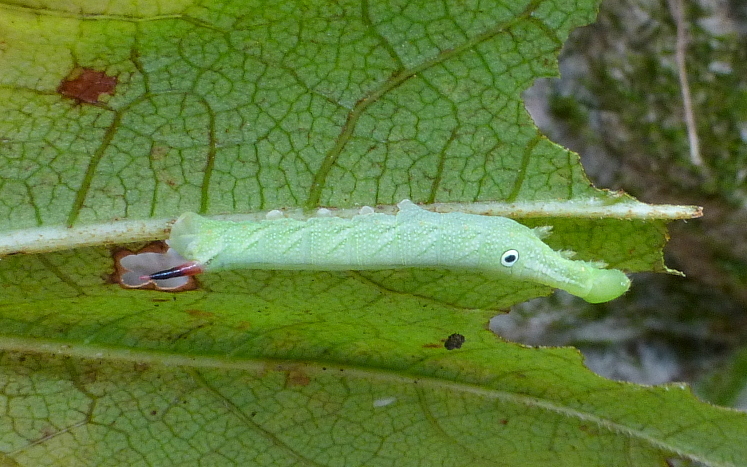 Larvae are usually found in June and September (Chu et al., 1979). Park et al. (1999) give early May until late August as the flight period in Korea. 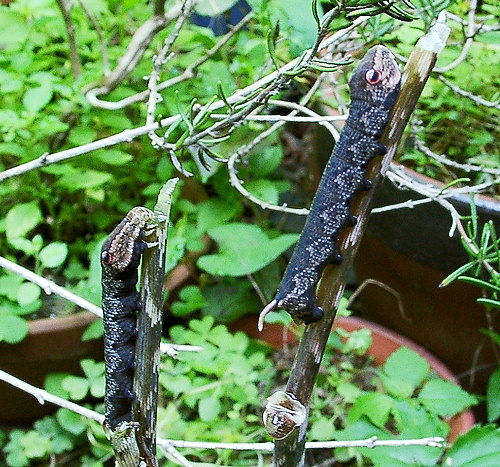 Larval hostplants. Recorded in China on Berberis, Cayratia, Impatiens, Polygonum, Parthenocissus tricuspidata and Vitis (Mell, 1922b; Yang, 1978; Chu & Wang, 1980). Records on Hedera nepalensis var. sinensis (Yang, 1978) and Viburnum macrocephalum (Wang, 1992) are certainly erroneous. Recorded in Japan on Cayratia japonica, Impatiens balsamina (Nozakai & Miyata, 1989), Zantedeschia aethiopica and Parthenocissus tricuspidata. Recorded in Korea on Impatiens balsamina and Galium verum var. asiaticum (Park et al., 1999). Recorded from the Russian Far East on Vitis amurensis (Izerskiy, 1999b). 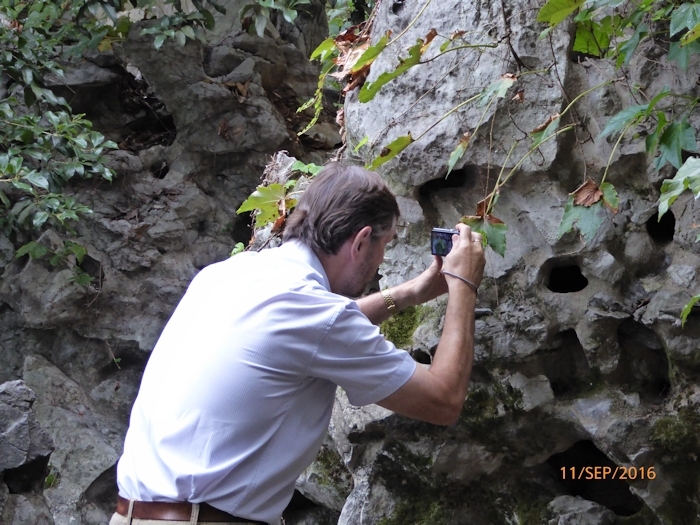 Recorded elsewhere on Cissus, Damnacanthus, Galium, Oenothera and Parthenocissus. Ichneumonidae: Amblyjoppa cognatoria (Smith). Tachinidae: Exorista sorbillans (Wiedemann). China: Heilongjiang; Liaoning (Changhai, Dachangshan Island); Beijing (Nankow Pass/Xuanhua; Baihua Shan; Badaling National Forest Park); Shanxi (Taiyuan); Qinghai (Nangqian County); Anhui (Mt. Huang Shan); Shanghai; Zhejiang (Tianmu Shan; Hangzhou); Hubei (Lichuan); Sichuan (Kangding; Pengshui); Guizhou; Hunan (Cili); Jiangxi (Jiujiang); Fujian (Longqi Shan); Guangdong (Guangzhou); Guangxi; Hainan. Taiwan: Taipei (Yangmingshan; Sindian); Kaohsiung Hsien (Shanping); Nantou Hsien (Jenai); Tainan Hsien (Kuantzuling); Taipei Hsien (Fushan; Wulai). North Korea: Kangwon Prov. (Keumgang-san); Kyonggi Prov. (Gaeseong/Kaesong). Japan: Honshu (Tokyo; Nashimoto; Yokohama; Mikaboyama, 750m; Yunotaira Spa; Nii-jima; Ikura; Bushi; Akana; Ohara); Shikoku (Chunan; Shioemachi); Kyushu (Kitakyushu; Mt. Takakuma); Yakushima (Aikodake; Kuromidake; Kusukawa; Miyanoura); Tsushima (Izuhara). Russia: Khabarovskiy Kray (Bolshekhekhtsyrskii Nature Reserve, Khabarovsk suburbs); Primorskiy Kray (Kaymanovka; Vladivostok; Jankowski Peninsula; Khasan; Primorskiy; Kedrovaya Pad Nature Reserve; Ussuriysk; near Zanadvorovka; Andreevka). Found throughout China, north to Mongolia, Korea and Primorskiy Kray, Russia, and east to Taiwan and Japan.